Safariland SLS EDW Holster - Model 6520 FREE SHIPPING! The new SLS EDW Holster Model 6520 from Safariland, is a tough, dependable and rugged carrier specifically molded for M-26 and X-26 TASER® devices. Safariland's self-locking system does not require a strap, allowing lightning fast, single-motion draws. With no snaps to fumble with, one quick motion is all that is needed to draw and wield the TASER®. The locking system secures the weapon into place, protecting the user from attempted weapon takeaways. The locking hood requires a special twisting action to unlock it. Unauthorized attackers attempting a takeaway with direct upward pressure will soon discover the weapon won't release and only becomes more secure. The result is a ultimate weapon retention that can only be unlocked and drawn by the wearer. 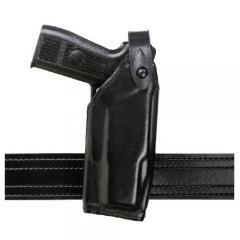 The holster attaches with an SLS clip and can be adjusted to any preferred angle on belts 1.5-2.25 inches wide. ©2002-2019 CopsPlus.com: Safariland SLS EDW Holster - Model 6520 FREE SHIPPING!